Encore Diesel Exhaust Fluid (DEF) + 1 | CSESCO INC.
Trucks fleets are rapidly converting to Diesel Exhaust Fluid (DEF), providing you with another opportunity to make your site a destination for drivers. They want convenient fueling and payment, for all fuel types. Gilbarco Veeder-Root is the only supplier to offer you a full product line to greet these new opportunities, including Encore DEF + 1 dispensing equipment. 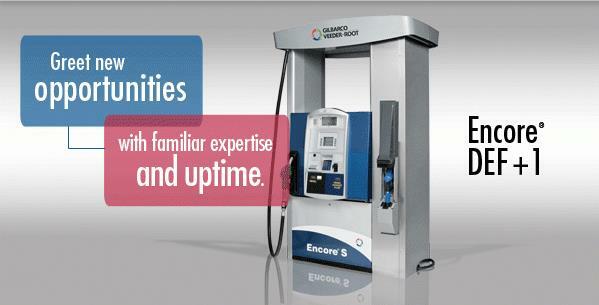 Most reliable equipment with maximum uptime and lowest total cost of ownership. Your customers can fill their diesel tanks as well as Diesel Exhaust Fluid (DEF without the mess and inconvenience of DEF jugs and funnels. Our innovative DEF dispensing equipment features meet the needs of your customers and build profits. The unique meter and all DEF hydraulic components are made of stainless steel or other approved materials to protect against corrosion. Our Diesel Exhaust Fluid (DEF) dispensers feature thermostat controlled, heated cabinets to prevent DEF from freezing and crystallization. Specially-designed optional hanging hardware is enclosed in the heated cabinet until needed.